I need to say, first off: I completely and totally regret what I wore to my senior prom. It was white, it was totally late-80s, and it was completely forgettable. What I should have done was be daring (like Lola, who wants to attend her mid-winter formal as Marie Antoinette) and completely memorable. So, one of my favorite things about this book was all the costume changes that Lola went through. I never knew what she was going to wear, and somehow, that made the book that much more enjoyable for me. The plot is pretty simple: Lola and Cricket used to be neighbors. Then they were more than neighbors. And then he moved away because his family is pretty invested in following his sister Calliope’s dream of being an Olympic figure skater. But before that happened, he hurt Lola, so she’s spent the last two years trying to forget that Cricket ever existed. It’s worked so well, that she’s happily in love with Max, who’s a punk rocker and (gasp) five years older than she is (she’s barely 17). Then, one day, Cricket (and his family) move back in. Lola figured she was over him, but she didn’t count on him not being over her. Second thing I adored about this book: Cricket. Seriously. He’s nice. No: he’s wonderful. Swoon-worthy, geeky, genius, awkward, and much, much too good for Lola. 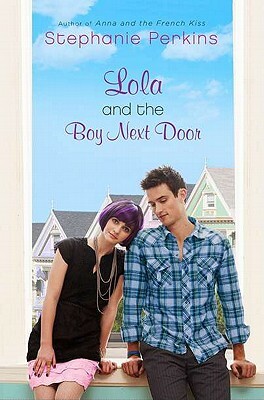 It was an interesting twist having the guy be the “good” one, the one that Lola has to aspire to “deserving”. (I find it’s often the guys who are the cads, but in many ways Lola is in this book.) At first she pushes Cricket away, but eventually realizes that she still has *feelings* for the boy next door. I found, in this book, that it was the little things that made it enjoyable. Anna and St. Clair are back, and even though they only play a small role, they light up the pages they’re on. Lola’s two dads are also a delight: it’s nice to have a gay couple shown as stable and loving without making a big deal about it. (Additionally: they’re great characters in their own right.) That said, I still have issues with True Love (always have, always will) and this one is all about finding and recognizing True Love, but it wasn’t enough to get in the way of me thoroughly enjoying this book. Perhaps it comes down to the awesome Marie Antoinette dress after all.